By ElReyDel757, April 23, 2016 in Cigars Discussion Forum "the water hole"
I know that a wineador or coolerdor is better to store multiple full 25 count boxes in, but for various reasons, I am partial to the tupperdor. I am also partial to Boveda packs over beads. My next project will be a coolerdor, but until then, can anybody assist with some questions on storing full boxes please? 1. I know that all boxes purchased from 24:24 are already opened for inspection. Roughly how long would a full box with the seal opened stay fresh without being put in the tupperdor? 2. When I store full boxes in the tupperdor, do I simply need to put Boveda packs in the tupperdor itself, such as on top of the closed full boxes, correct? The Boveda packs don’t have to be actually placed inside the individual closed 25 count cigar boxes? 3. Does anybody have a tupperdor recommendation for storing roughly 20 boxes of 25 count cigars? 4. For a tupperdor, Boveda recommends 2-3 packs for 250 cigars. Would this be the same for full boxes? Using my example of a 20 full box / 500 cigar tupperdor, I would need 4-6 Bovedas? When shipped, the cigars are packed well enough that it won't dry out or damage the cigars, even without a 8-gram Boveda pack. Then finally, once you receive them, just give them ample time to re-acclimate to proper storage temp/humidity and you're golden. 2. I tend to put boxes in and try to keep them staggered (as in not having a pyramid shape and trying to have pockets of space here and there. Then I throw in 3-4 of the 60-gram Bovedas in those spaces, up top, and at the bottom. Up until recently, I would just open them up to let air circulate a bit and check on the packs and maybe even move them around. But having tried the new Xikar fan, I love it so much that I had to get one for each of my tupperdors. I also used to put some smaller packs into boxes thinking they might not get enough humidity, but after awhile you learn that they do just fine. 3. I would suggest getting one that you know will give you ample room for those 10 boxes, maybe 24-30"L / 18"w / 12-15"h. Obviously on the bigger side if you wanted to store more boxes. This would give you 5 boxes per half easily. Just remember to get one that has a foam seal or some sort of feature to have it airtight from the outside environment. Also, store it in a closet, basement, or somewhere cool and dry. 4. Boveda packs in Tupperdors DEFINITELY last a lot longer and are closer to the rH listed on the pack since there isn't porous wood to draw humidity from. For 20-boxes/500 cigars, I would say right around 6 60-gram packs would do you good. Thanks for the info, it is greatly appreciated. I know the cigars are fine during shipment, but my question was more about how long an unsealed but closed and full 25 count box would last without being put in a humidifier, after I have received them? I don't think most people would test to find out? 1. The fact that the seal is broken really has very little to do with keeping the cigars "fresh". The cigars coming from Rob will arrive tightly and nicely wrapped in paper, then plastic bubble wrap, then placed in the shipping envelope. When you receive those, they should immediately go into your tupperdor which should be acclimated at a steady relative humidity level of between 60% - 65% for best taste and burn. To answer your question as to how long they could stay in the package as shipped before putting them in ideal storage conditions, the answer to that probably has more to do with the ambient rH they will be sitting around in the shipping package. If, for some reason, you can't get the box immediately into your tupperdor, I would leave them wrapped in the shipping package until you can get them into the tupperdor. They should be okay for several days or even longer as long as the ambient rH is not ridiculously high, say over 80%, or ridiculously dry, say less than 50%. I wouldn't leave them in these extreme rH conditions for more than a few days. During shipment, they will encounter all sorts of temperature and rH extremes over the roughly two weeks in transit. I've never seen any negative impact caused by those conditions, with the exception of smoking one immediately upon receipt of the package and most times the taste and burn is not as good as it will be after acclimating the cigars in your tupperdor at 60%-65% for at least 30 days, better to give them 60-90 days to acclimate before smoking them. 2. Place the boveda packs in the tupperdor, not in the boxes of cigars. 3. When I used a tupperdor, I had great results using a clear plastic box with a "water tight" lockable lid. For humidification, I used a 6" tube of Heartfelt beads (65% beads) and it was rock steady. As stated earlier, I recommend a storage rH of closer to 60%, but 65% will give good results. 4. Sorry, can't advise on the number of boveda packs. What Danny and Stogie said. The "seal" is not an airtight seal on the box, so how long those sticks will last has nothing to do with the seal being broken and is completely dependent on your local humidity. If you happen to live in a house that is magically 65F and 65%rH then your box will be just fine on your desk! If you have a place with stable temperatures, then the tupperdore storage method works great. Wide temperature swings however can cause the interior humidity to go to dew point and that's a bad thing. But if your room or cellar is a fairly constant temperature, then the bovedas can handle the rH swing that comes with minor swings in temperature. And with a watertight tupper those bovedas will likely go a year or more. I put in 15-20 bovedas (65%) in my 40 gallon tuppers that are completely full with boxes. I just sprinkle them on top. Remember not to accidentally get one between boxes and squish it: they can leak! It's all food grade salts, so you can smoke the cigars after they dry out (happened to me once, the cigars were actually quite good!). Rob's crew does a great packing job and I've never had anything arrive damaged. I once got curious about conditions, and for a while when a new box came in, particularly one that had been long in transit, I would take out a cigar or two and slip in a hygrometer and zip it all up in a plastic bag. The interior of the box always read at 65-67% rH. So these sticks are doing o.k. in transit. Why? At least put it in a plastic bag/zip lock, if you don't have any other options. That's mostly dependent on the temperature and humidity surrounding the box. Say you have two boxes arrive with the interiors at 65%rH and the stogies with the water content appropriate to that rH. Then you stick one box in your study, where the air conditioner and humidifier keep the room at 70F and 50% rH and the other box you put on your patio table in Arizona at 90F and 15%rH. Obviously the hot, dry environment is going to create a very strong vapor pressure inside the box wanting to get out, and there goes all your H2O. Here in San Francisco, it seems that boxes dehydrate pretty slowly but then it's typically 50-65%rH and 50-70F ambient and that's very cigar friendly. I've never tested this thesis to failure by leaving a box out forever, but I'll bet I could leave one on my desk for several weeks and have the cigars be just fine. I personally prefer using coolers vs tupperware. The thick insulation of a cooler helps minimizes swings in temperature that happen throughout the day. I like tupperdors as much as the next guy and keep 2 small ones for some singles, but Wal-Mart has tons of large marine grade coolers in stock right now and the cost is not going to be much more than a larges size tupperdor. If you are spending a significant amount of money on cigars why not give them that extra level of protection with a cooler. I have a cooler and a tupperdor, the downside of a cooler is they tend to have fairly limited space, so I had to add a tupperdor for my overstock. I recommend the Heartfelt beads too, I use Bovedas bc I started off with them but they can get pricey quickly, the 2 Heartfelt tubes have worked great in my Tupperdor and do fine for extended periods with no fussing. StogieLuvr basically said what I said but more thoroughly, he covered it all. For my overflow, I've been vacuum sealing boxes with a 65 Boveda inside (double seal both ends). Then I put the vacuum sealed box in a ziplock (I know, prob not necessary but still do) then I put the boxes in an airtight/waterproof gasketed clear container my wife got me at the container store. Container goes into a dark closet. This is until I can get my refrigerator project with Ranco completed. I've done the double-ziplock-with-a-boveda storage for overflow and it's worked great for months at a time, so long as the space was temperature stable. And ziplocks are more permeable than GG's vacuum seal too. Around what size cooler would I need for say, 20 boxes of 25 count cigars? Cabs, slide lid or dress box? Mostly dress boxes, but I suppose a combo of all in the end. I see many recommendations for 54 quart tupperdors or 56 quart coolers. About how many 25 count dress boxes would a 56 quart cooler hold? I use the 150qt white igloo coolers for storage. I store roughly 25 boxes in each but could hold more. I use 1 4oz xikar gel jar in each cooler. They stack nicely and top ones slide on bottom ones to move for access. In cigars, I see freshness and a matter of taste, one used to describe the taste of a newer made cigar. I am not going to detail this further, but leave it to personal interpretation. For the record I did not read all the responses, I scanned them. I scanned them for the word ambient, which I might have missed but did not see. Rather than speculate about what could happen, here is what I did. 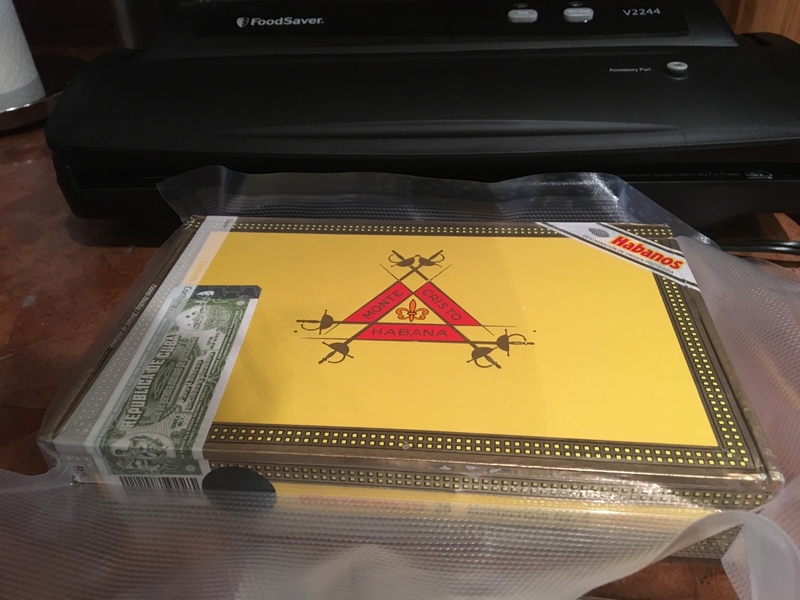 I took a box of cigars, the box is a SLB originally holding Punch RS12’s. I have since filled it with a bunch of Monte 4’s that I bought in cardboard tubes. The cigars and the box have been together since 2007 so it is not like there is anything new going on here. The box (and the cigars) have been in one of my controlled humidors. I would like you to take note, that even in the humidor that is well controlled, the rH and temp vary in the box, despite the superior control that I keep with the humidor. Look to the left of the vertical line. I did not remove the data logger from the box to time stamp it, I did not want to disturb it and cause a deliberate air exchange. Instead I time stamped the Ambient logger and it read 5:50pm approximately. Now I have to apologize here some, I ran this little test rather hastily in order for those viewing the thread not to lose interest in it. I did not give the box in the humidor really enough time to recover from opening it to install the data logger, and then not long enough in the open air, but you should get the picture anyway. Nonetheless, this should help you understand your question and the forces at work on your cigar box. So without further delay look at the chart. I have added to the chart, the ambient conditions of the area next to the box when the box was removed and placed atop one of my humidors. It has been cool here the past couple of days, and so the temperature is not far removed from that of the humidor. Imagine it being 85˚F in the shop and 20rH and you could see your cigars getting really dry in a relatively short time, even in the box, under these conditions. The chart shows the conditions in the box and the ambient. You will notice that the air in the box exchanges far faster than you might have imagined, as it pursues the ambient rH line. Given enough time, you would likely see a point where the cigars themselves begin to support the internal box rH. At this point the rH inside the box is in fact dampened by the cigars themselves. Of course the cigars themselves are not exactly going to follow suit immediately. The water is bonded in them, where it is only present in the air in the box. That is a huge difference… Free water, and bonded water cannot be compared with this chart. It is however simply an indication of where the condition of the cigars will go if left there for a protracted period of time. Testing this over a 24 or 48 hour period is not going to do anything catastrophic to my cigars. Leave them out 2 to 4 weeks and you could and likely would be in a different boat, depending on the ambient. I would say, with some Tetris-style storage arrangement at work, 21-24 boxes would be feasible (including enough room for a humidification device). Got my first vacuum sealer. Hopefully I did this right. Do y'all leave any air or let it vacuum seal shut completely? Damn look at you go! Nice! I wouldn't worry too much about a little air, you can squeeze as much out as is easy to do, but still avoid crushing the box. The big thing with the vacuum seal plastic is that it is much less permeable than ziplocs, so you're greatly reducing vapor exchange and the loss of any tasty flavor compounds over time. What tiny amount of air you have in that bag won't exchange with the outside and will be quickly saturated with cigar goodness and then stay that way until you eventually crack that seal. I bought 24 pack of boveda 65% 8 gram.. My wineador is currently keeping at 62-66%.. All my boxes are closed not open or even cracked open. I was thinking of throwing 1 pack of 8 gram boveda packet in each box or cab.. Is that ok? Or a no no? My opinion it's not necessary at all. You don't need Bovedas inside the boxes.